Easton lawn care just got a whole lot easier. If you live in Easton, CT or the surrounding areas, the hassle of keeping your home lawn looking good doesn’t have to be such a pain. Yard maintenance including grub control, shrub care, core aeration and other yard care takes time and patience and often requires quite a bit of knowledge to keep your grass green and your landscape looking its best. It’s not easy knowing when to fertilize, whether you need lime or not, how and when to seed and a host of other things lawns need to be healthy and beautiful. Thankfully, Red Carpet Landscaping is here to help you create a lush lawn and garden that you can be proud of. We have been serving the Westport area since 2009 with our lawn care services and lawn maintenance, rejuvenating and caring for yards with our extensive home services. We use only the most effective, safest products and have the most knowledgeable and experienced turf management technicians to make sure every project results in 100% guaranteed satisfaction. Many of us take pride in tackling do-it-yourself home care projects, and lawn and yard care is certainly one of the most popular and one of the toughest to get right. Every lawn is different and understanding what it takes to keep your lawn looking great is no easy task. Fertilizers, lime, seeding, topsoil, climate conditions and an array of other factors all play key roles in creating a healthy, great looking yard. 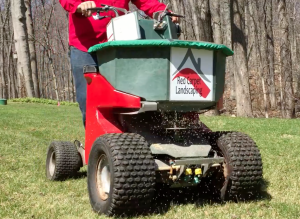 Here are just a few reasons a lawn care service just might be the best option. Time. It takes a lot of time to create and maintain a beautiful lawn, and in today’s busy world, few of us have the time to learn turf management and yard maintenance, much less actually getting out there and getting it done. A professional lawn care service knows how to get the job done quickly, and most importantly, how to get the job done right. Even with a good working knowledge of lawn care and some available time to devote to the project, many homeowners find that even when they carefully follow the right steps, there are often disappointing results. Something as simple as picking the wrong fertilizer or applying the right fertilizer at the wrong time can mean wasted hours with nothing to show for it. While it’s true that hiring any professional home services company will have a certain cost, you may be surprised to learn that lawn care services can be quite affordable when you consider all the options. You already know the time that can be saved by hiring a lawn and turf company and that time can often be converted into dollars. You remember the old saying, time is money? While time can be money, there are other factors that can make the prospect of hiring a lawn care company a good value. Fertilizers, seeds, compost, and all those other elements that go into building a healthy home lawn can be quite expensive. Add in the fact that there are many other factors that determine successful results such as knowing the right nutrients, the Ph levels, and more, and it’s easy to see that there could be a lot of trial and error (and money!) before getting things right. Hiring a pro takes out all that guesswork and potentially unnecessary costs. A beautiful lawn! Even with plenty of time and understanding what your lawn needs (and doesn’t need) to look its best, the chances of getting things just right the first time can be pretty low. That means more time, more money and you still have brown grass and withering shrubs. If you really want that green, healthy lawn that your neighbors will envy, the choice to hire a lawn care service that guarantees results and has the right experience and knowledge makes the option worth careful consideration. If you decide to let the pros take care of your lawn care and lawn maintenance, Red Carpet Turf will be happy to evaluate your home lawn and design a comprehensive plan to revitalize your yard and landscaping. We will test the soil for Ph levels, determine what nutrients your lawn needs to be healthy again, select the very best products for your yard, and whatever else is needed to get the job done to your satisfaction. Once we get your yard looking great, we offer maintenance programs to keep your lawn and garden healthy and beautiful. You end up with a yard and lawn that you can be proud of year after year, save time for other important things in your life and enjoy your backyard once again…all at a reasonable cost and guaranteed. Our lawn care program features custom blends of phosphate-free fertilizers with slow-release technology to produce a beautiful, lush, green turf. Your lawn serves as a barrier between your home and the wilderness. 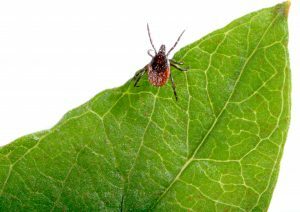 Ticks and fleas can pose a serious health threat to your family and pets. 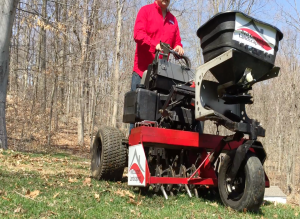 Relive a compacted lawn and overseed to get the best possible lawn. Experience the Red Carpet Treatment. Sign Up for one of our Standard Weed Control or Organic Fertilizer Turf Programs for a perfect lawn. Our goal is to provide the best Lawn Care in Easton Connecticut. We are looking for the WOW factor! Sometimes our sales pitch isn’t quite enough. For that we regularly ask our customers to review the services we are providing them. Below are the most recent reviews we’ve received. Good or bad we are posting them here for you.